Harold comes in to talk to Madge. He's shocked as it would appear Des has sold his share of the Coffee Shop without consulting him! Madge can't believe it, but Harold is adamant it's true – he saw them shake on it. Harold goes on to tell Madge that he heard the man talk about knocking walls down etc. Madge believes Harold has every right to be angry. She tells him to go and talk to Des. 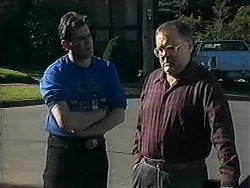 HAROLD: Des just has to learn, friend or no friend, no-one can afford to treat Harold Bishop lightly! Madge tells him to be tactful and Harold agrees to be. Gemma is talking to Ryan. Gemma asks if Ryan dated Annabel, to which Ryan replies that they did. Gemma is surprised because she didn't think Annabel was Ryan's type. Ryan tells Gemma that Annabel is a nice person, and Gemma should come to his party, to get to know her properly. Gemma agrees. The conversation then moves onto Gemma and Matt – Ryan notices that they're getting on well lately. Gemma agrees and then talks a lot about Matt. Clearly bored, Ryan makes his excuses and departs. Todd wants to arrange to do something with Cody over the weekend, but Cody says she's going camping with her Dad. She then suggests he goes with them but Todd isn't sure her dad will agree. Speak of the devil, Des comes through from the bathroom with Cody's dad who's giving him a quote for the bathroom. Cody asks her dad who thinks it's a good idea: “the more the merrier”. Harold confronts Des about the whole Coffee Shop thing. Des explains its Cody's father for his renovations on his bathroom, not the buyer of the Coffee Shop. Harold is surprised but Des quickly forgives him. Des asks if Suzanne Sharpe looked at the Coffee Shop earlier and Harold explains what happened, how she overheard him talking to Cody's father and saying how bad the Coffee Shop was. Harold says it was an innocent mistake. Des is angry. And there's only one person who's interested: Felicity Brent. Harold says Des couldn't – she's a monster. Des doesn't seem to care – if she's got the money then she's in. Gemma thanks Matt for the car and bike repairs. She invites him to the party as a sort of ‘thank you' but understands if he doesn't want to be seen with a school girl. He doesn't think of her as school girl and he accepts. 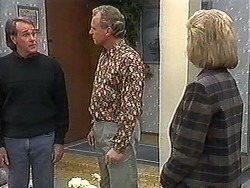 Doug comes to see Des and Bev to ask if it's OK if Todd can go bushwalking. But, a typical youngster, Todd hasn't mentioned it. Jim says he loves fishing as does Bev so Doug invites them both along. Bev is pregnant so declines. Jim takes a rain check – another time. 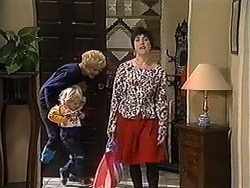 Kerry leaves Sky with Madge and Gemma. 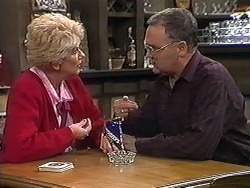 Harold comes in and explains to Madge his mistake about the Coffee Shop. Harold says they now have no good buyers - other than Felicity Brent. Harold is upset as he must sell his half too if Felicity buys it. 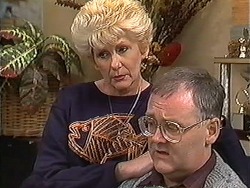 Madge comforts him, as Harold explains he wants life to be worth living, and it wouldn't be if he had to work with her. Matt says tell Ryan that Clarrie's car is ready. Ryan says he'll pass it on and then invites Matt to his party. Matt says he's already going as Gemma invited him. Ryan didn't realise they were together but Matt says they're not and would he have a problem if they got together? Ryan says of course not. As he leaves Matt says that he and Gemma are having dinner first before party, so they might be a bit late. Todd is helping out in the kitchen to make sure Jim doesn't change his mind about Todd going camping. Jim thinks it's a good idea and would like to go himself but the timing is wrong. Todd says that Doug is always doing things with Cody, so he obviously doesn't have the same problem with timing as Jim has. Jim doesn't think it's right to go without Bev, just as they've got back together. Todd knows it makes sense but still wishes Jim could come. Kerry, Madge and Sky come in. Madge tells Kerry about the Harold situation. They decide that if they find Harold difficult then how would Felicity or anyone else manage with him. I have to just point out here that Sky is being so cute! They agree that Harold is a difficult man to please. Madge doesn't think Harold's perfect business partner exists, but Kerry disagrees, she thinks she has the perfect person! Jim helps Bev with the dishes. Bev tells him that she doesn't expect to be waited on for the next 9 months. They talk about the camping trip and Bev thinks Jim should go. Jim explains that he doesn't feel it's the right time for him to go with Todd but Bev assures him that nothing is going to happen and Todd's needs are more important because he needs a father-figure. Jim agrees to go and they kiss. Madge is dressed up, ready to go out, but won't tell Gemma where. Ryan knocks on the door to see Gemma – he wonders if she'd help him set up for the party. She says she will. They talk about her inviting Matt and Ryan is surprised that she asked him because of her boyfriend in Brisbane. Gemma says that she doesn't think it's anyone's business except hers and, with that, Ryan leaves. Madge questions Gemma about Matt, who points out that they haven't been out on a date and this is only a ‘thank you' for the help with the car. Madge leaves. 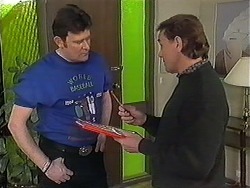 Jim has come to ask Doug if it's still OK for him to go bush-walking and camping. Doug says of course it is, he'll need the company and conversation anyway. Doug says they plan on doing a lot of hiking too – he hopes Jim is up to it! Des has found Harold a new partner. Harold is disgusted that he hasn't been consulted but Des says it was a good offer and he needed to make a quick decision. 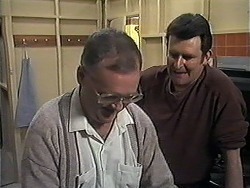 Harold wants him to unmake the decision and is very angry, but Des says he can't, all the legalities are almost sorted. 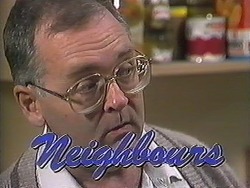 Harold rants about how he has a migraine coming on because Des, his ‘so-called friend' has sold his share of the Coffee Shop to Felicity Brent. DES: It's not Felicity Brent. DES: Oh, you'll find out. HAROLD: I want to know now. DES: Oh, oh fair enough, because your new partner's here. DES: Well, aren't you going to ask them in?